Psoriasis is a skin problem whose causes are not entirely clear, usually characterized by symptoms such as redness and defamation in some parts of the body. There are eating habits and natural remedies against psoriasis that can help to control its symptoms, especially in its mild forms. The Psoriasis is an inflammatory skin disease that can occur at any age in life and showing characters often chronic, widespread equivalently between women and men and that affects approximately 2-3% of the population in the world. There are natural remedies that, in association or not with a pharmacological therapy, can help in the management of symptoms. The causes of psoriasis are not fully understood, but a multifunctional aetiology is supposed, which means that different factors are involved including genetic predisposition, autoimmunity and environmental factors. The ” plaque ” psoriasis, which is the most widespread form, is characterized by the formation of thick plaques on the skin and in particular at the level of scalp, elbows, knees, lumbar region (lower back), inguinal / genital region and sometimes palms of the hands and soles of the feet. The extent of the disease is extremely variable and periods of improvement and worsening of symptoms are frequently possible. The skin lesion has a characteristic appearance of white peeling, so the pieces of skin come off and fall, leaving the skin red (erythematous). The psoriasis is manifested mainly in the form called “plaque psoriasis”, with the formation of so-called plaque, whereby an area of the skin reddens and becomes covered with silvery-white scales that then flake off continuously. 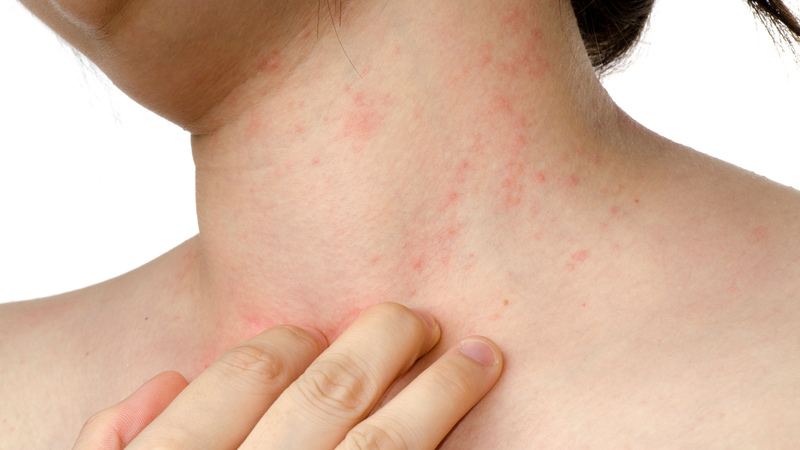 The pruritus may be present but usually not there. In most cases, in which the cutaneous areas concerned are relatively small and there are no other associated complications, the disease mainly represents a social discomfort for the person, going to affect the quality of life. The causes that determine the onset of psoriasis are not yet fully defined. It is conceivable that there may be an interaction between genetic and environmental factors and among them could be stress conditions, concomitant diseases, bacterial or viral infections or other. A relationship with some metabolic problems may occur and some studies hypothesize a relationship between altered lipid profile and the onset of psoriasis. The role of intestinal and cutaneous microbiota is also being studied and new evidence is expected. Finally, as mentioned, psoriasis is considered a pathology with a possible autoimmune cause, which leads to an excessive growth of the skin cells. The diagnosis of psoriasis, in most cases, is clinical, which means that no further study is needed. However, in certain cases, they may be associated with the visit of particular blood tests, especially when a suspicion of “psoriatic arthritis” or other comorbidities is associated with the skin lesion. Psoriatic arthritis is a rheumatological condition that sometimes, but not always, is accompanied by typical psoriatic lesions. A precise diagnosis should be made by a doctor, possibly a dermatologist specialist, who differentiates psoriasis in the form of plaques (the most frequent), guttate, inverse, pustular, erythrodermic and others. Guttate psoriasis, in particular, seems to be preceded by particular bacterial or viral infections. Depending on the degree of extent of the disease, three frameworks called light psoriasis (which has a limited number of skin lesions), moderate (with an involvement of a larger area of ​​the body but in any case less than 10%) or severe (in which the plates cover more than 10% of the body surface). The therapy is local (topical) in light cases, while in more aggressive forms it is necessary a systemic therapy with drugs to be taken by mouth, consisting mainly of immunosuppressive drugs or biological drugs. A phototherapeutic therapy can also be associated with these. This article and the remedies suggested below, refers in particular to the forms of mild psoriasis. In the case of psoriasis, in addition to the possibility of taking beneficial natural remedies, it is also important to follow behavioral rules that can help not to irritate the skin further. It is advisable to use exclusively natural soaps, such as Aleppo soap or oat milk, and keep the skin soft only with oils, butters or natural ointments, such as borage oil or karite butter. It is also good to wear natural cotton clothes and linen and avoid synthetic and non-breathable clothing. It is also found that the symptoms could be attenuated by bathing in sea water and sun exposure, in fact, often the disease decreases in the hot season: it is therefore useful to stay in the sun at the allowed time and take baths in the sea, as well as take baths in the tank using Dead Sea salts. Even spa treatments sometimes show benefits for the patient with psoriasis. You may also like to read: Skin spots, how and why? As for the natural remedies that follow, they are always to be taken under medical supervision, in order to correctly select the most suitable ones, to exclude the possible presence of interactions with any drugs taken and to evaluate the need for association with a conventional pharmacological therapy. Particularly useful against psoriasis are jojoba oil, borage oil, the almond oil and the neem oil. These oils, individually or mixed and always selected 100% pure, can be applied on skin lesions and have a nourishing and emollient effect on the skin. Sometimes it is also possible to take them by mouth. This oil derives from traditional Chinese medicine and has shown itself capable of attenuating the severity of the disease if applied regularly at the local level. The black currant has important anti-inflammatory properties and is a useful addition to be taken on a daily basis at times to be established with the doctor, for a more or less prolonged period. Both of these natural remedies possess general anti-inflammatory properties and can be a valuable complement to all skin diseases, including psoriasis. The Aloe vera has many properties and is indicated in psoriasis as soothing, anti-inflammatory and immunomodulatory, especially in the form of cream to apply several times a day. Also this plant, inserted in products for local treatments, can help to alleviate the symptoms of psoriasis . Making green clay-based compresses is a useful remedy for psoriasis and other skin problems, but not only; an important precaution is to treat the affected area with an emollient oil just removed the clay pack, since the latter tends to dry the skin a lot, giving a feeling of dryness. A compress of chamomile, or chamomile mixed with apple vinegar, can be applied immediately after the clay pack, with an emollient and above all a soothing action. Among the remedies against psoriasis we also find probiotics. In fact, an alteration of the micro biota (resident intestinal microflora) may be involved in all skin problems . For this reason, a nutritional supplement with selected milk enzymes can be useful, to be taken in the majority of cases for a prolonged period of time (weeks or months). In the case of psoriasis, it would be advisable to pay attention to eating habits. In particular, the frequent introduction of antioxidant foods and all vitamin complexes would seem to benefit . It is also useful to implement the diet with borage oil, flake beer yeast and wheat germ oil and ensure an abundant level of hydration every day. Psoriasis is not contagious, so it is not possible in any way to transmit the pathology from one subject to another. Psoriasis does not present a slight problem in its own form, but it is necessary to know that patients with this condition are statistically at greater risk of developing other conditions such as intestinal or cardiovascular diseases.